Megan Langridge of St Mark’s Anglican Community School Hillarys was named the Young Women in Public Affairs Awardee for 2015 by the Zonta Club of Perth Northern Suburbs Inc. Zonta International is a leading global organisation of professionals empowering women worldwide through service and advocacy. Interestingly Kott Gunning Lawyers and Zonta International were both founded in 1919. 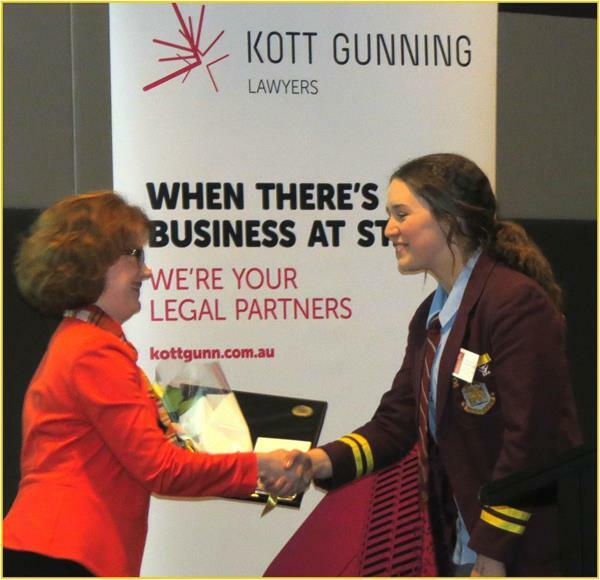 Kott Gunning Lawyers has supported these Awards for a number of years and value the opportunity to encourage volunteerism and encourage young women to become future leaders. The three finalists captivated the audience of over 70 by speaking about “The Woman Who Most Inspires Me”. The event was also attended by Ms Simone McGurk MLA, Shadow Minister for Community Services, Children’s Interests, Women’s Interests; City of Stirling Councillor Stephanie Proud; City of Stirling Councillor Elizabeth Re JP; City of Joondalup Councillor Teresa Ritchie JP. Read more on the Community Newspapers website. The goal of the Zonta International Young Women in Public Affairs (YWPA) Award Program is to encourage more young women to participate in public affairs by recognizing a young woman’s commitment to the volunteer sector, evidence of volunteer leadership achievements and a dedication to the advancement of the status of women. Applicants are asked to reflect on their voluntary commitment to their school and their community and the problems limiting the advancement of the status of women in their own country and worldwide. The Zonta International Young Women in Public Affairs (YWPA) Award Program looks to the young women of today for the leaders of tomorrow. The Award runners up were Sophia Drazevic of St Mary’s Anglican Girls’ School, Karrinyup and Isabelle Siegwart of Sacred Heart College, Sorrento. The Zonta Club of Perth Northern Suburbs Inc meets on the 1st Wednesday of each month at Rendezvous Grand Hotel, Scarborough. Visitors are always welcome and dinner bookings can be made via their Zonta Perth or via secretary@zontaperthns.org.au.